Birgitta Jonsdottir. Credit: Flickr/Florian Apel-Soetebeer/Government 2.0 Netzwerk Deutschland. Some rights reserved. Birgitta Jónsdóttir is the key figure in Iceland’s post-crash political renaissance — first as an organiser of anti-government protests and finally as one of the Pirate Party’s MPs for the last seven years. A self-described anarchist and 'poetician', the former WikiLeaks associate co-edited the Wikileaks Collateral Murder film. As the Executive Director of the International Modern Media Institute she has overseen the drafting of world-leading legislation on media freedoms and the protections of whistleblowers. Earlier this year, the Panama Papers revealed corruption at the highest level in the Icelandic parliament and the current popularity of the Pirate Party means that it could be in a position to form a coalition government after the snap elections on 29 October. For a whole year to March 2016 the party was consistently topping polls, with a peak of 43%. Their commitment to implementing the country’s ‘crowd-sourced’ constitution and to democratic renewal through core policies of direct democracy, transparency and civil rights has proved popular. The failure of successive governments to implement the new constitution (which was approved by 67% of the population in a referendum) has fuelled discontent and further boosted the Pirate Party’s ratings. 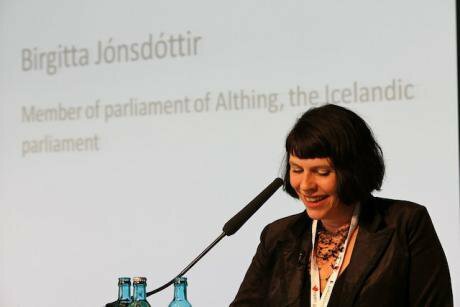 openDemocracy talks to Jónsdóttir about Iceland's "historic" political moment, preparing for power and her desire to empower women and change the "ugly" culture of politics. Phil England: Are the snap elections directly attributable to the revelations in the Panama Papers earlier this year? Birgitta Jónsdóttir: We had the biggest protests in the history of Iceland in the wake of the Panama Papers [in April] where people wanted the prime minister and the government to resign. The prime minister resigned but the government – although they offered to shorten their term of office by one year – are still in office. Even if they put forward a bill saying elections will be on 29th October they’re always threatening to hang on until April. But I don’t think they will. Iceland's biggest ever protest in the wake of the Panama Papers, April 2016 Credit: Flickr/The Reykjavík Grapevine. Some rights reserved. PE: Has much has changed since the crash and pots and pans revolution of 2008 and 2009 when you had all the corruption that led to the financial crisis? BJ: Nothing’s really changed in the heart of it. That’s why the Pirate Party has become very focussed on how we can change the system: because it seems like every day there is news about some very serious corruption – criminal behaviour really. And it seems that the system, those that are running it and the tools they have, are incapable of doing anything about it. I am in the oversight committee in Parliament. If there is a culture of corruption that is really deep you have to deal with it by legislating and by ensuring all the processes are in place so you can keep people accountable. PE: Right now you’re polling neck-and-neck with the centre-right Independence Party who were also implicated in the Panama Papers. BJ: Yes, the finance minister and the interior minister both had companies based in tax havens. They’re one of the oldest parties in Iceland. Since the forties they used to win every election. It’s really new for them to be polling below 30%. It’s a historic moment because they are splitting in three. READ MORE: Is Europe's old order too big to fail? PE: When I interviewed you last June you were asking other parties to join you in a pledge to implement the new constitution. Did you have any success with that? BJ: We just had a meeting with all leaders from all the opposition parties to see if we could put the new constitution as a priority and it feels to me that they are all ready to get on board with that. It’s not going to solve everything, but it is a very good ground to build on. PE: What are the other key planks of your election campaign? BJ: If we were in a position to form a government then I think it is critical that we have policies on all the main issues. But we have been focusing on four main things: changes in the fishing quotas system, reviving the healthcare system, implementing the new constitution and holding a referendum on whether Iceland wants to carry on with the EU membership bid or not. These big families have sort of just taken the fish and made it theirs. So they have been getting a lot of loans using collateral in the fish that the nation technically owns. We’ve put forward a policy based on putting it to market on auctions like they do in the Faroe Islands. And I think at least four of the parties agree on this path, so it’s quite likely that we could push it through. Then there’s also been this massive petition which 85,000 Icelanders signed demanding that politicians and parties resurrect the health care system. We feel that the changes in the fisheries law could give us the resources for this. If we get enough trust to form a government we will also use the opportunity to analyse all these different systems because ministers often complain about how difficult it is to go into these Yes, Minister scenarios [laughs]. For example, Syriza had really brilliant people but they were not really efficient once they got into office. 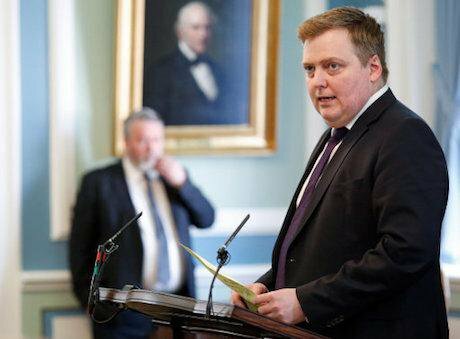 Sigmundur David Gunnlaugsson, who has since resigned as prime minister of Iceland, makes a statement on the Panama Papers at a parliamentary session in Reykjavik, April 2016. Credit: Brynjar Gunnasrson/ AP/Press Association Images. All rights reserved. PE: Iceland has topped the World Economic Forum index on gender parity for the past seven years. What’s the reason for that success and what remains to be done? BJ: I think because we’re few you get critical mass about things a lot quicker than many other countries. And we had very strong support for the women’s movement back in the day. [In 1975] there was this big women’s strike where women walked out from their work at the time when women were not getting paid as much as guys for the same job. And a lot of men walked out with them. Also in the 1970s this women-only party was created. It was like a cross-party party with only women to try to get into the parliament, to have a more equal balance in the representatives there. That had a huge impact because it applied pressure on the other parties. And now we have almost 50:50 in the parliament [in 2015 41% of Iceland MPs were female compared to 29% in the UK]. And so it’s just become the norm that women should have the same opportunities as men to represent in different aspects of society. But we had to put laws through to make sure that women were on the boards of companies and institutions equal to men, although we couldn’t do it completely 50:50. In the Pirate Party we don’t have laws that say we have to have man, woman, man, woman and so forth. We want to trust our members have already integrated into themselves that equality is the norm. And it was actually very interesting to look at our [candidate] lists in the capital area. It just naturally fell like that. I think to some degree you just have to trust people to have matured enough. But the other parties are not really there yet. It is difficult to get women to go into certain fields like finance and security, but we need women’s perspective in these areas. The tendency that women naturally go into the stuff that’s about welfare and human rights is striking and we’re trying to change that. Last term we actually had the first woman finance minister – a pretty good one actually [laughs] and we have a lot of women in the finance committee in Parliament now. PE: How important are gender issues to you as the leader of one of Iceland’s foremost political parties? 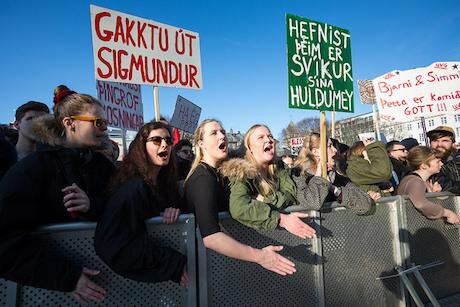 Have you experienced sexual discrimination in Icelandic politics at all? BJ: Well, first of all I’m not the leader. We’re trying to have the circle of power. For me, I have never in my life let gender issues stop me in believing I can do anything. I have had the same opportunities as a man because I don’t genderise myself when I’m following my dreams and passions. But I understand that the language about women in politics is sometimes quite depressing. If you are assertive then you are being bossy and it is considered to be negative whereas for a man it’s considered as being strong and it’s a positive thing. But at the same time I don’t care what people say about my style of being active in politics. Language is just something that needs to evolve and change. It doesn’t say anything about the abilities of women and men to do different things. You can have horrible women doing horrible things and horrible men doing horrible things. Politics is an ugly world where the gloves are always off and I want to change that culture. You know, to normalise this dishonest, backstabbing stuff. It’s not normal. I want to focus on empowering women so they can do anything. In the end, how can we make way for a society where people are honoured and given opportunities based on the quality of their work?